The Origins: Not many boats can claim the legend that is Phantom, a 50-foot wheelhouse cruiser christened on Jan. 19, 1936. She was designed by the well-known naval architect, Joseph Dyer, and was constructed at Astoria Marine Construction Shipyard. Original interior & re-fit: Phantom is made of double-planked Port Orford cedar over oak stringers with teak houses, teak decks and Honduran mahogany paneling inside. With a luxurious interior, a vanity was added for the first owner’s wife. There is also a bathtub constructed in Monel and a gas fireplace suitable for the damp, cold seasons in the Pacific Northwest. 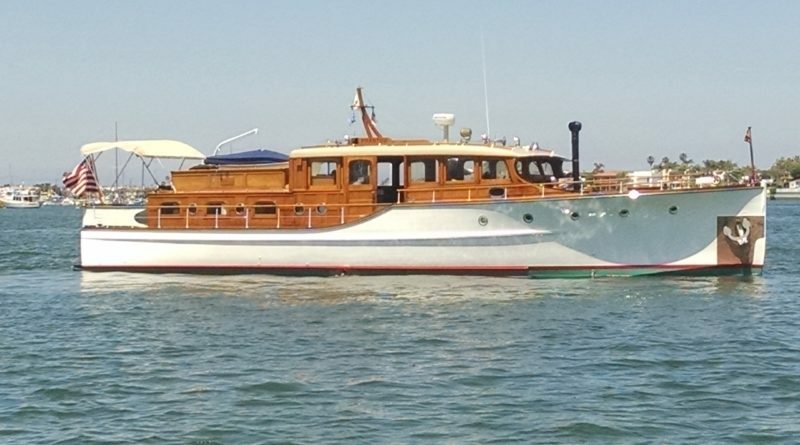 Though she was originally powered by twin Palmer Conversion Ford V8 engines, she is now fitted with two 240hp Yanmar engines, which are capable of reaching 21 knots. Phantom’s Naval Service: In 1941, Phantom was requisitioned by the U.S. Navy and served as a patrol on the Columbia River, which runs through Oregon, Washington and Canada. Her aim at this time was to protect the Kaiser Shipyard, and she was painted gray from bower to stern and re-fitted with a 30-caliber machine gun on her foredeck. The Theft of Phantom: A few decades later in the 1980s, Phantom was stolen, run into the Columbia Bar and left as abandoned. Her rescuer, a famed wooden boat enthusiast and member of Portland Yacht Club, Chuck Kellogg, spent three years restoring Phantom to her original glory. At Home in Newport Beach: The current owners Rick Ingold and Dean Kiser purchased Phantom in March 2017. “Phantom now flies the Balboa Yacht Club burgee and calls Newport Beach her home port,” says Kiser, who also cites he enjoys taking the family to Catalina for the weekends on this incredible boat. Awards & Honors: Anyone who lays an eye on Phantom recognizes she’s an especially valuable and historic wooden boat. In 2017, Phantom won “People Choice Over 40 Feet” and the “Harbor Masters Award” at the Newport Beach Wooden Boat Festival. I enjoyed the article. What a beautiful boat! !